Jeff Smith spent eight years as a reporter and sports editor before working for 15 years as a copywriter and editorial manager at Awana, one of the world's largest children's ministries. Today he operates Write for Your Cause, an editorial service, and writes sports articles for the "Daily Herald." If you or a family member has flat feet, you're not alone. Doctors say up to 25 percent of the population has a low arch, also known as flexible flat feet, while some people have inflexible, or stiff, flat feet. If you suffer from either type of condition, proper basketball shoes can help you avoid pain and perform at your best on the court by creating the proper arch shape and giving your feet stability and flexibility. Whether you have low arches or no arches in your feet, good basketball shoes are essential. Shoes that are built to support a low arch or no arch spread your body weight throughout your feet and up into your legs, giving your feet both stability and flexibility. 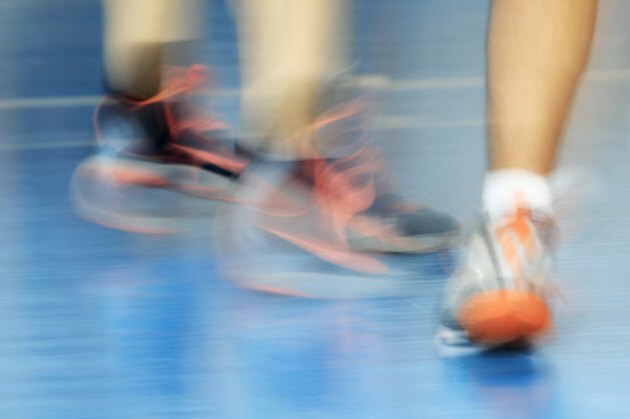 This helps prevent foot muscle strain and ligament damage and enables your feet to adapt to a variety of actions you take on the court, including running, stopping, starting, jumping, pivoting and landing after leaping. Quality shoes give flat feet additional support to handle the extra pounding they take from having a low or flat arch. Consider a few points as you select basketball shoes. Check the inside of the shoes. Do they support your flat feet with a specially designed sole that supplies the correct arch shape for retaining the arch? A shoe's design should create high arches that keep your feet in the proper high-arch posture. Your footwear should also have slightly raised heels that help you pivot your feet on defense and offense while bearing your body weight without undue stress. There are numerous flat-foot basketball shoe options. One popular style of basketball shoes among major shoe manufacturers is designed to support and strengthen the arches of players who play year-round. Another shoe style for flat-footed players offers excellent arch support and light weight. You can also find wide-fit basketball shoes on the market that help players with wide and flat feet. Some shoes are built to provide extra flexibility that strengthens your arch and your foot. You can also purchase removable orthotic insoles that give you arch support and fit in any sneaker you elect to buy. When choosing basketball shoes, it might seem to make sense to buy running shoes. Don't purchase running shoes. These types of shoes are created solely for forward movement and do not provide the needed support for playing basketball. Most running shoes feature a narrow sole that won't give your feet the necessary stability for jumping, pivoting and other athletic movements. Their rounded outer edges also leave you at risk of rolling your ankle whenever you perform any type of lateral move, such as a crossover dribble or defensive slide.